I’ve been teaching yoga full-time for six years here in Boulder, Colorado and have been teaching at Yoga Pod Boulder for two years. Throughout the years, I’ve had handfuls of pregnant women in my yoga classes. I’d give them some ideas for modification, but it was always conceptual information vs. embodied knowledge. 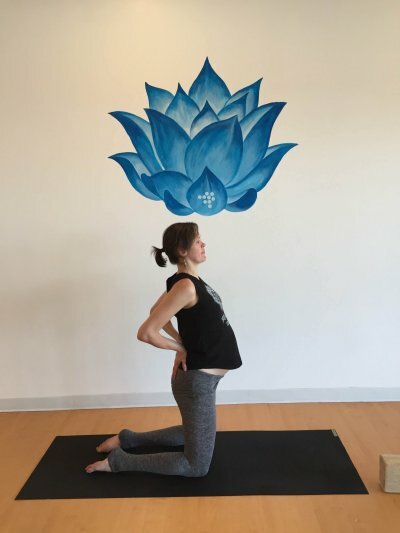 I’m now seven months pregnant and have discovered some interesting things in my own body as I practice yoga throughout my pregnancy. This blog is based on my own experience. As pregnancy is both a sacred and delicate time, please check with your healthcare professional about yoga classes. And, as always LISTEN to your BODY. Every woman experiences pregnancy differently. I’m writing what worked for me with the hopes that you might get some good ideas for your body. I’ve been teaching Vinyasa yoga (PodFLOW), YIN/Restorative Yoga and podFIT for six years. I have a strong practice, and this blog is meant for yoginis, and their teachers, who have been practicing regularly before they get pregnant. Pregnancy is not the time to be pushing your edges in your practice. If you do practice during pregnancy, it’s more for the joy of breathing, moving your body and taking time to feel. As tempting as it might be to try that crazy pose the teacher is offering up, pregnancy isn’t the time to attempt new challenging poses. If you are newly pregnant and new to yoga, try a PodGentle or PodFLOW Level 1 class (check our schedule to see these class times). PodGentle a great class for beginners, as well as those with limited mobility due to injury, prenatal/postnatal, seniors, and students seeking greater ease, flexibility, and concentration in their everyday activities. This yoga class includes basic breathing exercises, as well as a variety of foundational postures (standing, seating and on the floor), and utilizes blocks, bolsters, and straps. When I was in my first trimester, I felt pretty awful most of the time: nauseated, tired, and on an emotional rollercoaster. I maybe did one or two classes a week during that time. I chose to go to PodGentle, PodFLOW All Levels, PodFLOW 1 and YIN. Keep in mind: in your first trimester, it is okay to lie on your belly (as long as it feels okay for you). Plank and chaturanga are okay, maybe start working with cobra instead of upward dog. Start doing your twists in a vertical position, so that it is the upper spine that is twisting and the belly is not compressed. Supine twists are okay as long as your leg isn’t squishing your belly, I like to bend my knees, take my feet as wide as my mat, and just let my legs fall to one side. Keep vertical twisting practice up throughout the pregnancy. I felt like the queen of life and was craving a return to my favorite PodFLOW 2 and YogaTone yoga classes again. Even though I felt great, I significantly modified my practice. 1. For obvious reasons (there’s a tiny person in there), no more lying down on your belly. When the class does chaturanga, I do cow and cat and/or side plank. 2. Be careful pushing your body too much or over stretching one part. Your body is producing a hormone called “relaxin” which helps loosen ligaments to prepare the pelvis for birth. It does not make you more flexible, it actually makes you more prone to weird tweaks. So be aware not to stay too long in stretching poses, or do too many poses for one part of your body. Instead of doing belly up core, I’ve been doing wall squats with The Bloom Method’s belly pumping. I’ve taken out pretty much all back bends. If I do one, it’s camel, and I keep it in my upper back only. Over-stretching the belly can split the abdominals. No thank you. I love to lay back onto a block. and stretch out my chest that way. It’s been kind of funny, a lot of the yoga classes I’ve been to lately have been twisting classes, and of course there’s not a lot I can do in that realm, so I’ve been modifying poses my own way. When the class is in revolved crescent lunge, I do some spine strengthening in Warrior 1 which is great for supporting the growing weight of your belly and baby. Inhale straighten your legs, exhale fold forward no more than 90 degrees, inhale come back up, exhale return to warrior one. Make sure to keep your legs strong and your heart lifted. I also took a class recently that was a lot of belly down heart openers. This is a great place to do some table top spine and seat strengthening. From table top, inhale take your right leg back and exhale draw it into your right shoulder. Repeat 10 times, then switch to the left. 4. Around the middle of the second trimester, you won’t want to lie on your back anymore. The weight of the baby can be too much on the vena cava, a thick vein that brings deoxygenated blood to the heart. If that sucker gets squished, baby and mama lose blood supply. Do savasana on your left side. Grab some blocks and blankets to put under your head and in between your knees. 5. What about inversions? I personally haven’t been craving them much. If I do want a headstand, I’ll do it at the wall instead of in the center of the room like I used to. I’ve been more tired again, so I’m getting to fewer yoga classes a week. But the modifications are similar to second trimester. Of course, as my belly grows, and grows, and grows some more, it’s harder to fold forward (take your legs as wide as you need to). I’m also struggling a bit to step in and out of lunges and downward dog. I’m just taking it slow and widening my lunges as needed. Pregnancy is a wild ride of magic and mess. It’s an adventure and the more I drop my ego and check in with what my body needs, the better I feel. I trust that my body knows how to grow a baby, how to change shape, and how to get back in shape after. I’m choosing to let my mind be the humble partner of my body while it performs miracles. I just keep asking my body what I can do to support her in this process. I am in awe that a baby is just magically happening inside of me, and at the same time, I realize that my life is about to transform in a tremendous way. So I’m getting on my mat when I can, enjoying the freedom and spontaneity.